It is always better to prevent cavities from arising but sometimes teeth do develop decay. When a tooth develops decay, or caries, it will usually require a filling to remove the damaged portion and to help repair the affected part of the tooth. It is easier and less invasive to fix a tooth the when the decay is diagnosed early. 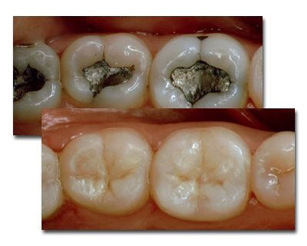 The larger or deeper the decay is, the higher the chance that the tooth may flare up at a later point. Tooth coloured or composite fillings, can be used to successfully repair most cavities. 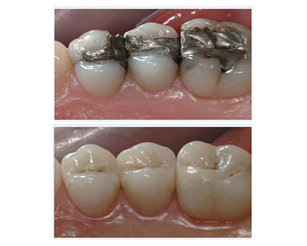 Amalgam, or metal fillings, are used mainly to repair posterior teeth. Under the NHS, white fillings can be placed on incisors and canine (eye) teeth as well as non-biting surfaces of pre molars and molars. See the pictures below for a before and after photo of a white filling.